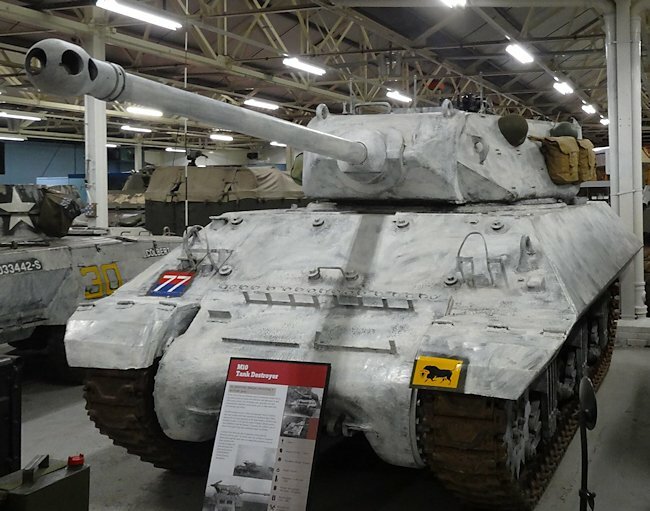 The M10 Achilles TD exhibit at the Tank Museum Bovington came from the Belgian Army and is painted to represent a vehicle in British 11th Armoured Division in the winter of 1944. The M10C Achilles was based on the M4 Sherman tank Chassis. It was powered by a General Motors 6046 conjoined twin 6-71s diesel engine that produced 375 hp. It has a top road speed of 32 mph (52 km/h) with an operational range of around 186 miles (300 km). It had a five man crew: commander, driver, gunner, loader and loaders assistant. Its armour was thin but sloped. It ranged from 9mm to 57.2mm in thickness. Its main gun was the powerful British Ordnance Quick Firing OQF 17 pounder Anti Tank gun that could penetrate the frontal armour of Tiger and Panther tanks. A machine gun was fitted externally to the open turret. This was a .50cal Browning M2HBB AA machine gun or a Bern Light Machine Gun. For some odd reason that we cannot explain the sight aperture has been plated over and the only visible sight is the so-called Alidale sight on the commander's side. This is fine for acquiring the target but useless for hitting it. The M10 never carried a co-axial machine-gun, a .50 calibre Browning was fitted at the rear of the turret and a .30 calibre gun, with tripod, was stowed on the vehicle for dismounted use. A note on names; some sources claim that in British service the M10 was called the Wolverine but there is no official evidence for this and on the face of it this seems unlikely. After the war the name Achilles I is said to have been adopted for the M10 17 pdr and Achilles II for the M10A1 17 pdr, and this seems to be in keeping with the British practice of christening self-propelled anti-tank guns with a name starting with A; Archer, Avenger and so on but again surviving evidence is scanty.